The United States Air Force/McDonnell Douglas KC-10A advanced tanker/cargo aircraft is a version of the intercontinental-range DC-10 Series 30CF (convertible freighter), modified to provide increased mobility for U.S. forces in contingency operations by: refueling fighters and simultaneously carrying the fighters' support equipment and support people on overseas deployments: refueling strategic airlifters (such as the USAF C-5 and C-l4l) during overseas deployments and resupply missions; and augmenting the U.S. airlift capability. 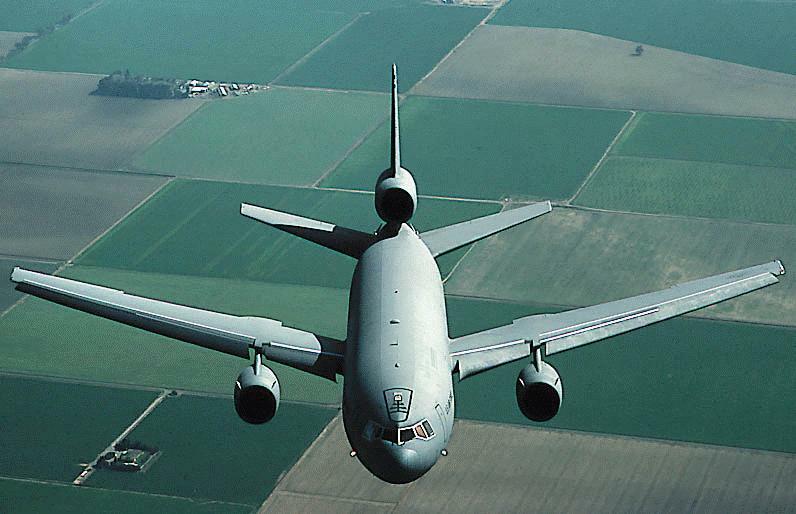 In most instances, the KC-10A performs these missions without dependence on overseas bases and without depleting critical fuel supplies in the theater of operations. 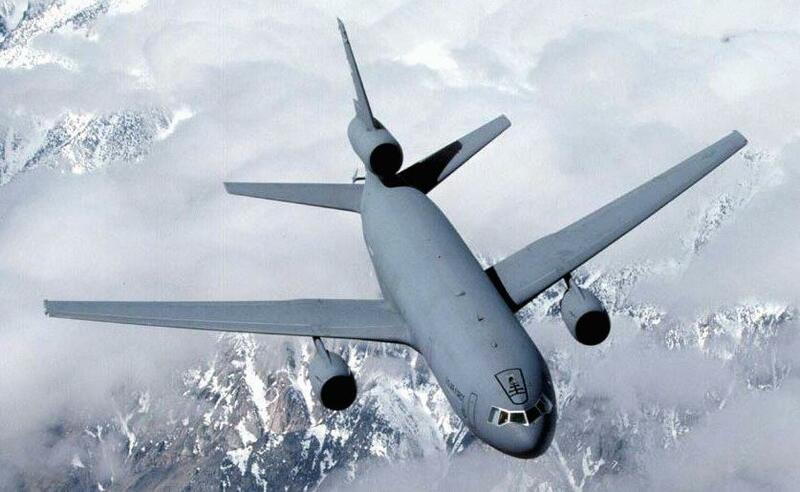 Equipped with its own refueling receptacle, the KC-10A can support deployment of fighters, fighter support aircraft and airlifters from U.S. bases to any area in the world, with considerable savings in both cost and fuel compared to pre-KC-l0A capabilities. The aerial refueling capability of the KC-10A nearly doubles the nonstop range of a fully-loaded C-5 strategic transport. In addition, its cargo capability enables the U.S. to deploy some fighter squadrons and their unit support people and equipment with a single airplane type, instead of requiring both tanker and cargo aircraft. 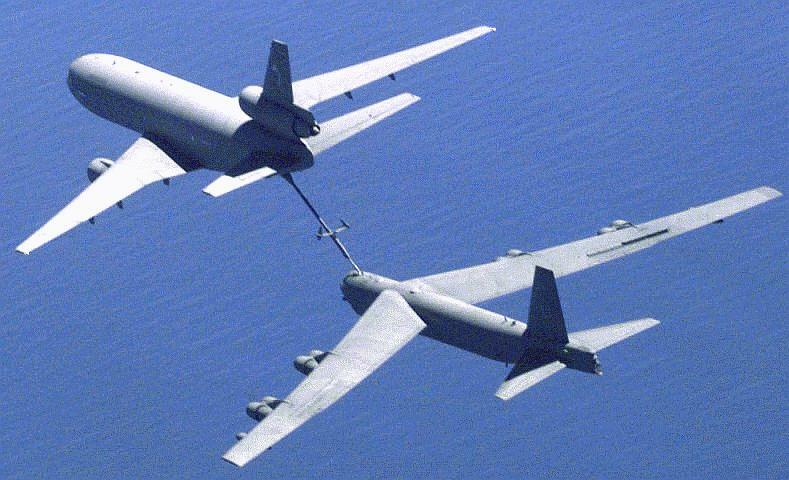 The Air Force is calling the KC-10A the "Extender" because of its ability to carry out aerial refueling and cargo mission without forward basing, thus extending the mobility of U.S. forces. 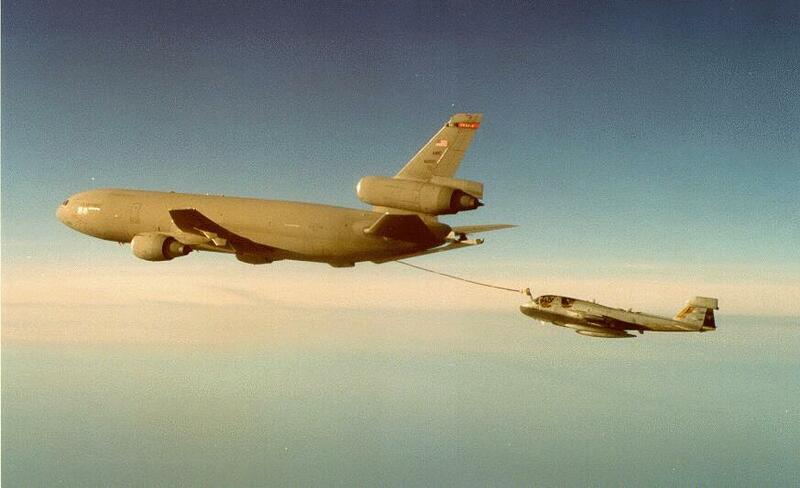 Although the KC-10A's primary mission is aerial refueling, it can combine the tasks of tanker and cargo aircraft by refueling fighters while carrying the fighters' support people and equipment during overseas deployments. 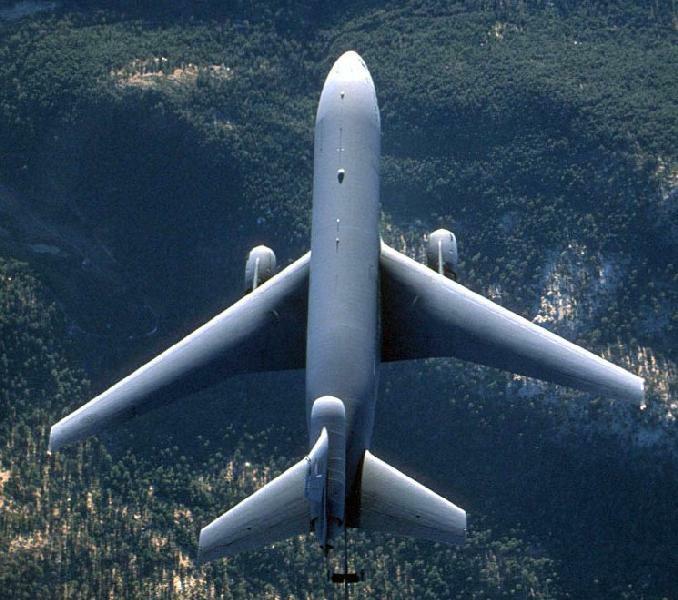 The KC-10A can transport up to 75 people and about 170,000 pounds (76,560 kilograms) of cargo a distance of about 4,400 miles (7,040 kilometers). Without cargo, the KC-10A's unrefueled range is more than 11,500 miles. The KC-10A tanker can deliver 200,000 pounds (90,719 kg) of fuel to a receiver 2200 statute miles (3539.8 km) from the home base and return, or it can carry a maximum cargo payload of 169,409 pounds (76,843 kg) a distance of 4370 statute miles (7031 km). Unrefueled ferry range of the KC-lOA is 11,500 statute miles (18,503 km). 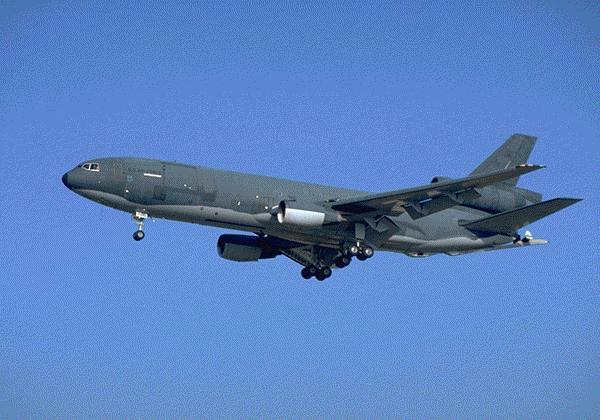 The KC-10A is powered by three General Electric CF6-50C2 high bypass-ratio turbofan engines, each generating 52,500 pounds (23,814 kg) of takeoff thrust. Versions of the CF6 engine family are installed on most of the DC-lOs in airline service and have compiled an impressive reliability record. One of the engines is mounted at the base of the tail above the aft fuselage of the KC-10A, and the other two are installed on pylons beneath the wings, one on each side of the fuselage. Like other intercontinental-range DC-lOs, the tanker/transport is 181 feet 7 inches (55.35 m) in length and has a wingspan of 165 feet 4 inches (50.42 m) and a tail height of 58 feet 1 inch (17.7 m). 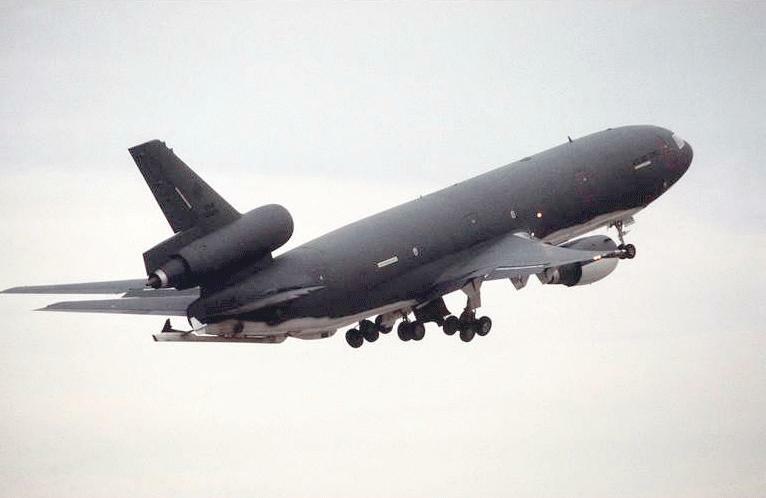 Gross takeoff weight of the KC-10A is 590,000 pounds (267,619 kg), up from 555,000 pounds (251,701 kg) for the standard intercontinental commercial model. 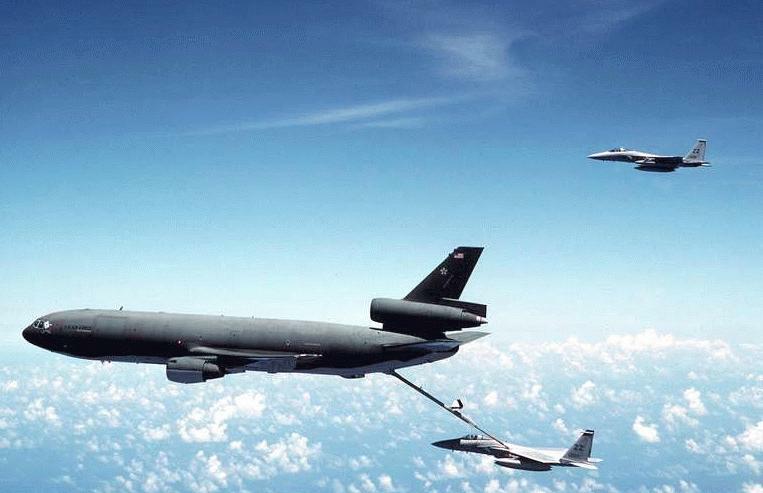 Design fuel capacity is 356,065 pounds (161,508 kg), including a maximum of 238,565 pounds (108,211 kg) in the standad wing tankage and a maximum of 117,500 pounds (53,297 kg) stored in seven fuel cells below the main deck. 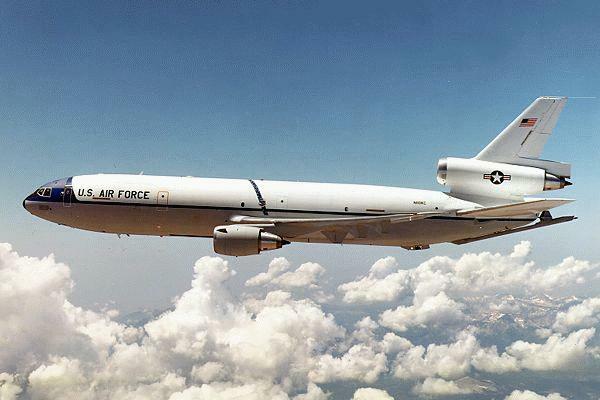 The KC-10A takes full advantage of the inherent capability of the commercial DC-10, retaining some 88 per cent commonality with the commercial aircraft. KC-10A modifications to the commercial DC-10CF include: elimination of most upper deck windows and lower deck cargo doors; provisions for additional crew; a flexible capability for accommodating additional support people; receptacle for in-flight refueling of the KC-10A itself; military avionics; director lights for the receiver aircraft; supplemental fuselage fuel tanks; modernized aerial refueling operator station; hose reel with drogue for refueling Navy and oher probe-equipped aircraft; advanced aerial refueling boom, and an improved cargo handling system. 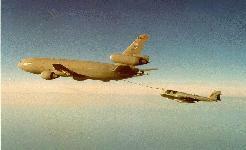 The KC-10A supplementary fuel tankage system, selected after extensive studies, includes seven unpressurized integral-body fuel cells, four aft of the wing and three forward, all located in underdeck vented cavities. A crashworthy design makes use of keel beams and strategically placed energy absorption material to protect the tanks. Under-fuselage panels permit direct access to each cell for installation, removal, system inspection and maintenance and structural inspection. The KC-10A's boom operator controls refueling operations through a digital fly-by-wire system. Sitting in the rear of the aircraft, the operator can see the receiver aircraft through a wide window. 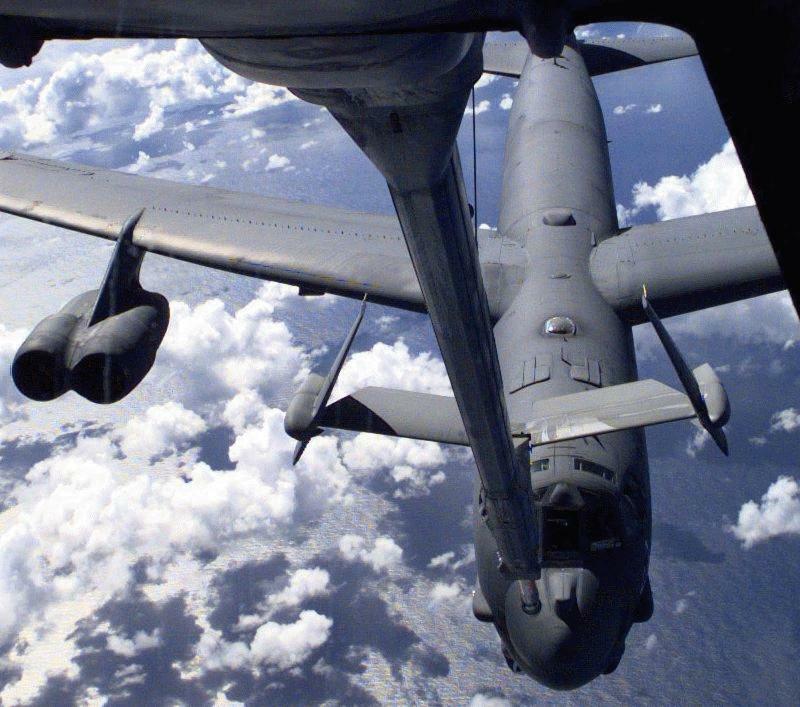 During boom refueling operations, fuel is transferred to the receiver at a maximum rate of 1,100 gallons (4,180 liters) per minute; the hose and drogue refueling maximum rate is 470 gallons (1,786 liters) per minute. 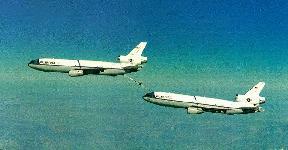 The KC-10A can be air-refueled by a KC-135 or another KC-10A to increase its delivery range. 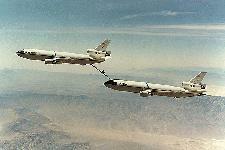 The advanced aerial refueling boom designed by McDonnell Douglas offers significant advantages in operational safety, efficiency and fuel-flow rates. It features larger disconnect and control envelopes, independent disconnect capability, an active control system with digital fly-by-wire controls, automatic load alleviation, position rate sensing to assure disconnect within control limits, precision hand controllers with low force requirements and operator-selectable disconnect limits. 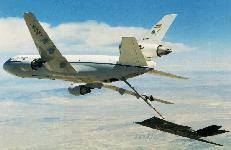 An additional feature in the KC-10A refueling system is the installation of the hose reel and the capability to change from hose to boom refueling, and vice versa, while in flight. 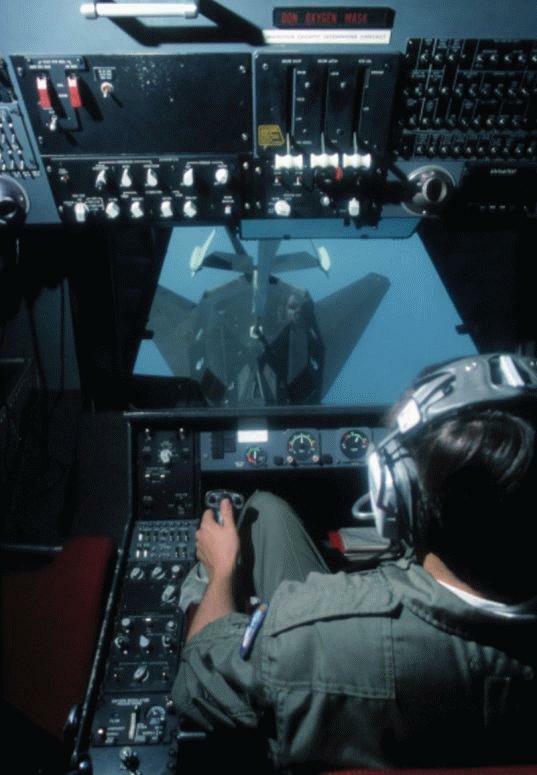 The aerial refueling operator's station in the KC-10A, located aft of the rearward lower fuselage fuel tanks, features improvements in comfort, viewing capability and environment. Instead of assuming the prone position required in current tankers, the refueling operator sits in an aft-facing crew seat. Station equipment includes handy refueling controls, a wide viewing window facing the aft "customer" position and additional periscopic viewing arrangements for traffic management. Accessible from the upper deck, the station is pressurized and has independent thermal control, a quiet environment and an arrangement suited for both training and operational missions. While refueling requires only one operator, two additional seats are provided to accommodate an instructor and an observer. For its cargo-carrying assignments, the KC-10A has a total usable cargo space exceeding 12,000 cubic feet (346 cu m) in its spacious cabin. The cabin has a maximum width of almost 19 feet (5.7 m), ceiling height of 8.5 feet (2.5 m) and a floor area of 2200 square feet (304.25 sq m). In all-cargo configuration, the KC-10A acccommodates 25 standard 88 x 108-inch (223.5 by 274.3 cm) cargo pallets in the cabin with aisles down both sides, or 27 pallets with a single aisle. To facilitate the handling of cargo, the KC-10A is equipped with a versatile system to accommodate a broad spectrum of loads. The system, adapted in part from the commercial DC-10, has been enhanced with the addition of powered rollers, powered winch provisions for assistance in fore and aft movement of cargo, an extended ball mat area to permit loading of larger items, and cargo pallet couplers that allow palletizing of cargo items too large for a single pallet. The features, plus the large 102 by 140-inch (259 by 355 cm) cargo door that swings upward on the left side of the forward fuselage for loading and unloading, give the KC-10A the capability to transport a significant portion of the tactical support equipment of fighter squadrons. Several configurations exist for personnel and crew accommodations. One arrangement is for the crew of five, plus six seats for additional crew and four bunks for crew rest, with an environmental curtain between bunks and the cargo net. The same area also has space for the installation of 14 more seats for support people. In another arrangement, the bunks, environmental curtain and cargo net can be shifted rearward, making room for 55 more support people, along with the necessary utility, lavatory and stowage modules, raising the personnel capacity to a total of 80 crew and support people. 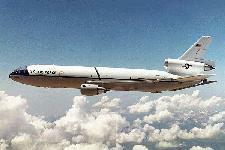 Although all eight of the DC-10 upper deck passenger doors are installed as standard, three are deactivated. Normal entry and exit are through the two forward passenger doors on each side, and the aft right-hand door is available as a ground emergency exit for people in the aerial refueling operator's station. With the KC-10A program, the USAF is taking advantage of the nearly $2 billion invested by McDonnell Douglas and its subcontractors in development of the DC-10 and of the huge investments by the airlines in establishing a worldwide support system, thus reducing both the acquisition and operation costs of the KC-10A as compared to an all-new military development. The U.S. Air Force and McDonnell Douglas signed contracts totaling $148 million in November 1978 for production of the first two KC-l0s, for the balance of the non-recurring engineering costs and for the initial spare parts and other support for the KC-10 program. A second contract, calling for production of four additional KC-l0s at a cost of $173 million, was signed November, 1979. At the same time, a $10.1 million logistics support contract option to provide spares and support equipment was signed. The first flight of the KC-10A took place on July 12, 1980. 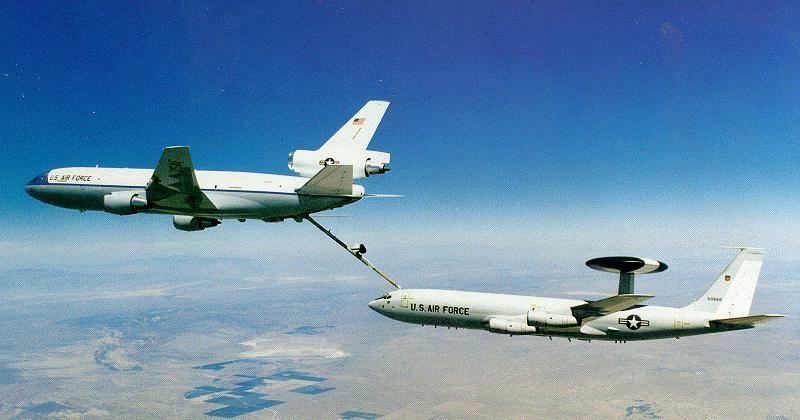 The first aerial refueling occurred during testing on October 30, 1980, with the receiver aircraft a C-5.The first KC-10A was delivered to the Air Force on March 17, 1981. The KC-10A force of 60 aircraft is based with the Air Combat Command at Barksdale AFB, La., and at March AFB, CA, beginning in the fall of 1982. The KC-10A acquisition program was directed by the Air Force Systems Command's Aeronautical Systems Division (ASD) at Wright-Patterson Air Force Base, Ohio. Prime contractor for the design, development and production of the KC-10A is the Long Beach, California-based Douglas Aircraft Company division of McDonnell Douglas Corporation, St. Louis, Missouri. 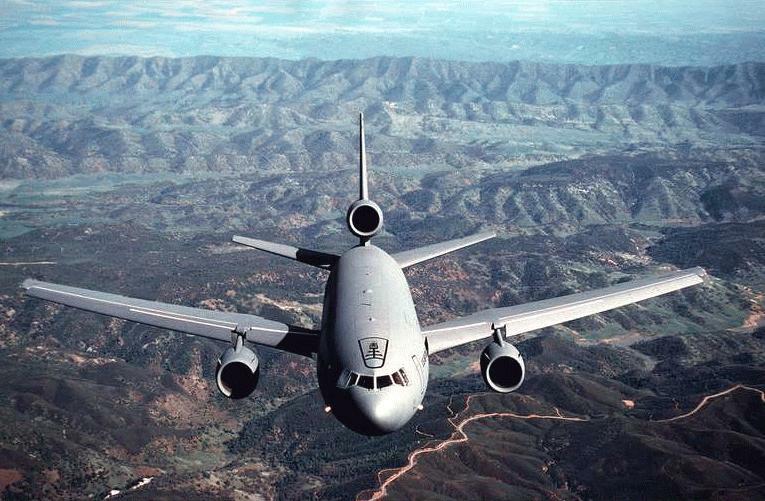 As one of the newest aircraft in the AF inventory, the KC-10 requires little maintenance and modifications when compared to older military systems. 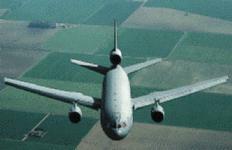 The KC-10 complies with FAA Stage 3 noise standards. 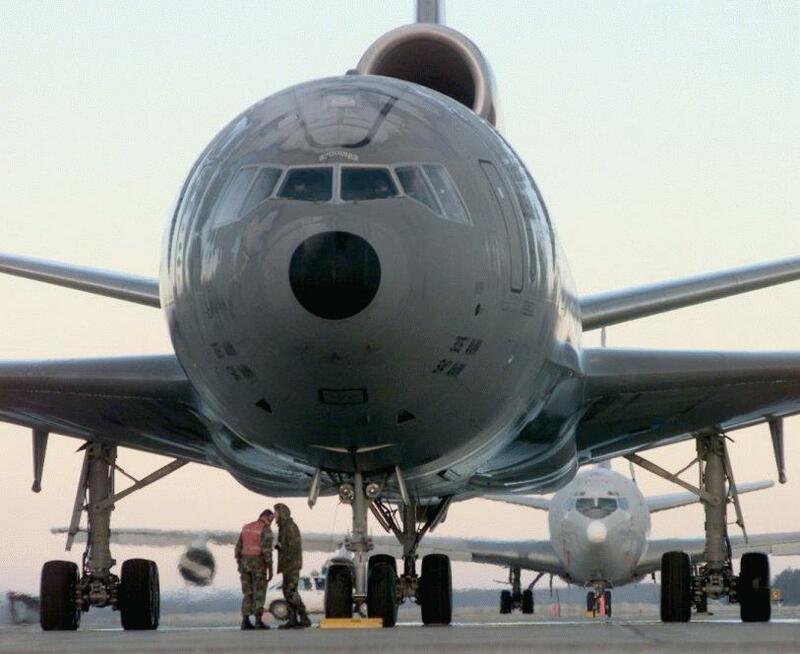 Designed with a service life of 30,000 hours, projected structural service life of the KC-10 extends to 2043. State-of-the-art technology and commonalty with commercial counterparts ensures operations in the near future will remain economical. However, as the commercial fleet reaches maturity, major operators will discontinue DC-10 use, leaving smaller airlines as the only remaining civil users. 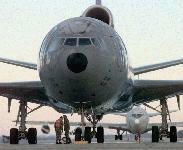 The first round of commercial retirements by 2010 will undoubtedly impact the economy of future Air Force KC-10 operations. Studies to assess that impact and to reevaluate the economic and structural service life will be required. Fifteen aircraft are modified with two wing-mounted air refueling pods which allow for simultaneous operations with probe equipped aircraft.